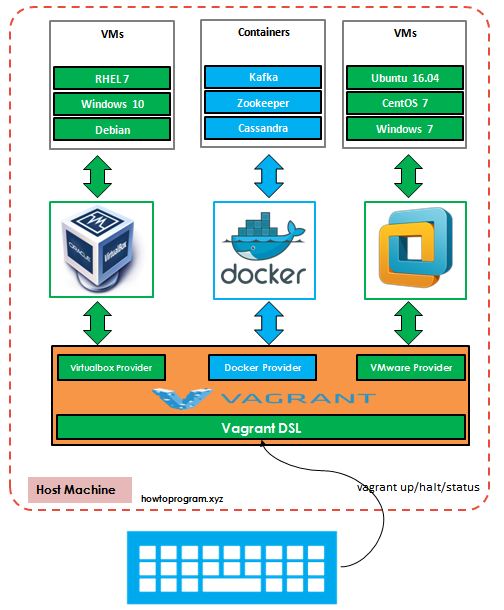 Vagrant, a great tool for managing lifecycle of virtual machines, is not the same with Docker, another great tool for building and running software container. In this tutorial, I’d like to introduce about Vagrant Docker Provider which allow our development environment to be backed by Docker container rather than virtual machines. 1. Introduction to Vagrant Docker Provider. We often use Vagrant as a tool to facilitate our development environment. We may want to quickly create and provision a virtual machine. We may want to provision an virtual machine which includes all necessary development environment for a specific project and share that image with the team for reuse. Or we may want to quickly define a full stack of virtual machines with different configuration specs including number of CPU, memory, network, etc for the whole environments like Dev, QA, UAT, and Production. Vagrant is a great tool to support us to do that. However, Vagrant doesn’t do that alone. Basically, it needs other virtualization tools with it like VirtualBox, VMware, Hyper-V, Docker, etc. Vagrant requires us to define the configuration that we need in a file called Vagrantfile. In here, we can use the unique syntax, which provided by Vagrant, to define the operating system we need like CentOS 7, Ubuntu 16.04, etc with 8GB of memory, 2 CPUs, IP address, etc. Base on that file, Vagrant will stand in the middle, translate that file into the languages that VirtualBox, VMware, Docker can understand and then execute those translated commands. We can call the unique syntax Vagrant Domain Specific Language (DSL), and the translation engine is Vagrant Provider. By default, Virtualbox is the default provider of the Vagrant. Besides, there are some other official providers such as: VMware provider, Hyper-V provider, and Docker provider. So, generally speaking, if our environment has Vagrant and any proper above virtualization tools like VirtualBox, Docker, etc installed, and we know the Vagrant DSL, it will be easy for us to manage lifecycle of our VMs and containers. Below is an example of Vagrantfile. This is a configuration for a Ubuntu trusty 64-bit. When the VM is started, its internal port 9092 will bound the port 9092 of the host OS so that network traffic can be sent back and forward, and it will be assigned an private IP address: 192.168.33.10 in the private network of VMs. And here are some commands to work with Vagrant and that Vagrant file. They were very basic Vagrant commands. You can refer to my previous post for more basic Vagrant commands. Note that those commands are the same for all providers which is the same type (VirtualBox, VMware, Hyper-V are VM providers while Docker is container provider). 2. Basic Usage of Vagrant Docker Provider. As you may know, Docker is a type of container virtualization technology that gains a lot of attraction in recent. Docker containers created by Docker and virtual machines created by VirtualBox, VMware, Hype-V are not the same thing, but Vagrant provides us an additional way so that if we want, we can also manage lifecycle of software containers. That’s why Vagrant Docker Provider has arrival. Let’s see how a Docker container is defined in Vagrantfile. 2.2. Basic usage with Docker files. When we execute: vagrant up –provider=docker, Vagrant will build the Docker image based on the file ./my-docker/Dockerfile and start the container automatically. 2.3. Some basic commands to work with Vagrant Docker provider. The vagrant docker-exec can be used to run a new command in a running container. If the container is paused or not stopped, the command will be error. For example, below command will create a new file /tmp/helloword inside the above apache running container , in the background. This vagrant-docker-logs command is used to see the logs of the running container. For example, below is the log of the apache container. vagrant docker-run -- echo "hello world"
If you would like to learn more about docker command, you can refer to the Vagrant website. We have learned about Vagrant Docker Provider, in a circumstance that Vagrant and Docker can work together to benefit us in facilitating the automation of our environment. If you are familiar with Vagrant in managing virtual machine and now you may want to use Docker containers instead, you can make use of Vagrant with Vagrant Docker provider.